Property price increases in Belize stalled in 2008, as the contagion from the global financial crisis spreads to this small tourism-dependent country. In the absence of official house price statistics, it is very difficult to gauge how much house prices have actually changed. Some local real estate agents claim that house prices barely fell in 2008 and were holding on their value in early-2009, while some indicators show that prices have fallen by as much as 50%. According to Belize First magazine, asking prices on houses, condominium units and land have fallen in 2008, but not to the extent that they have in the US or the UK. Property sales volumes have also reportedly dropped. However, the 2008 Coldwell Banker House Price Comparison Index (HPCI) suggests a more alarming picture: the average price of four-bedroom houses in San Pedro, Ambergris Caye dropped 50% to BZ$694,454 (US$349,000) in 2008 from a year earlier. The Coldwell Banker HPCI is an annual snapshot study, which evaluates the average sales price of 2,200 sq. ft., four-bedroom, and 2.5 bath single-family dwellings in corporate middle management suburbs in different markets around the world. Belize’s real estate market grew rapidly from 2000 to 2007, fuelled by the passage of the Retired Person Incentive Act (RPIA) in September 1999 and the boom in tourism and construction during that period. Prices of inland residential properties rose by about 15% annually from 2003 to 2007, according to local real estate agents. In coastal and tourist areas, property prices have risen by as much as 30% every year over the same period. Residential properties in Belize are sold for a wide range of prices, from as little as BZ$30,000 (US$15,000) for simple Belizean-style houses in rural areas up to BZ$5 (US$10) million for oceanfront mansions located in coastal areas. In Ambergris Caye, the country’s exclusive high-end area, prices of oceanfront condominium units range from BZ$500,000 (US$250,000) to BZ$2 (US$1) million. In Placencia, the island’s southern coastal area, oceanfront condo units are sold for an average price of BZ$560,000 (US$280,000). In Belize Grove, a recent eco-resort located in the Caribbean coastline, property prices start from BZ$310,000 (US$155,000). In Cayo District, where the capital Belmopan is located, prices of riverfront houses start at just around BZ$100,000 (US$50,000). In Belize as a whole, real estate prices are relatively inexpensive by Western standards. The median price of oceanfront houses was about BZ$306 (US$253) per sq. ft. and BZ$600 (US$300) per sq. ft. for oceanfront condominiums, according to revealrealestate.com. However, let the buyer beware! In Belize, there are two prices for everything—the local price and the “rich foreigner” price. Since majority of properties for sale are not advertised, the best way to get a feel of the difference between the Belizean price and the non-Belizean price is to travel to the country and spend time among the local people and the expats. Belize has been successful in attracting affluent foreign retirees to settle in the country in the past decades. The country has received the largest foreign population in Central America since 1983, according to International Organization for Migration. Even with the increase in population, Belize (2007 pop. = 314,300) remained one of the least densely populated countries in the world. Permission to conduct business within Belize if business activities are carried on mainly outside of the country and are not conducted with Belizeans. QRPs can also own rental properties. The mortgage market in Belize is relatively small. Despite sharp growth in the housing market, the mortgage market has been sluggish over the past years, due to the following reasons. The pool of financially capable Belizean property buyers is small; as a result there is little demand for mortgage loans. The Belize real estate market is very dependent on wealthy foreign and expat buyers, who usually pay in cash. Non-resident buyers, who seek financing for their property purchases, find it very difficult to get mortgage loans from banks in Belize. For those who are lucky to find one, the maximum loan-to-value (LTV) ratio was 70%, with term period of 20 years. Mortgage interest rates are high in Belize, usually about 4% - 5% higher than home, driving foreigners to obtain financing in their home countries. A combination of natural factors – climate, the Belize Barrier Reef, a Caribbean flavor, as well as the Maya ruins—Belize is truly Mother Nature’s best kept secret. Bordered to the north by Mexico, to the west and south by Guatemala and to the east by the Caribbean, Belize considers itself to be both Caribbean and Central American. As an ecological paradise, tourists flock each year to marvel at the pristine beaches and virgin forests, with the second largest reef barrier in the world, including the Blue Hole, which can be seen even from outer space. Three of the four breath-taking coral atolls in the Western Hemisphere are also located off the coast of Belize. There are numerous varieties of wildlife shelter in the inlands. Bird watching, nature trailing, and water sports are popular in Belize. Belize prides itself on being the seat of Mayan civilization, with well-preserved archeological sites throughout the country, such as the Caracol, Lamanai and Xunantunich, which are easily accessible to tourists. 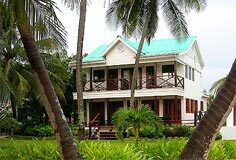 Belize, the only English speaking country in Central America, has attracted affluent foreign real estate buyers for the past decades, particularly from the US, Canada and the UK. Ambergris Caye, the top tourist destination in Belize, is a particular focus of attention. Belizean house prices, rents, and letting income - real data! How expensive are houses in Belize, compared to the rest of Caribbean? How much rent can be earned from Belizean property, compared to the rest of Caribbean?